Welp, that’s Christmas for me. I was braced for another blow to my belief in my country and by damn . . . . 2018 just got a tiny bit brighter. You know those songs you sing along to and hate yourself for because the lyrics are about awful people but the music is catchy? 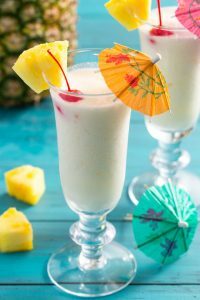 That’s how I feel about the Pina Colada song. Because hiring a plumber is exactly like giving money to a powerful abuser so he’ll have more power to continue his decades-long harassment of women. So I’ve decided not to add to their revenue stream because they just hand it over to a serial sexual predator. I’ve been trying to get somebody on the site chat box to talk to me, but strangely enough, no one is available. It’s noon, maybe they’re all out to lunch. Or maybe, I hope, they’re reaping the whirlwind. At any rate, thanks for trusting me, Angie! I know I’ve made the right decision. 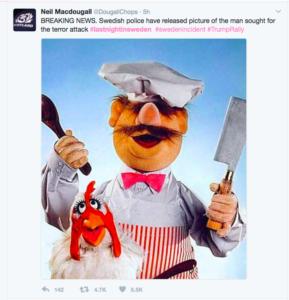 Evidently Trump cited the horrific events that happened “last night in Sweden” during his love fest campaign rally for the 2020 election. This would be just another alternate fact in the increasingly bizarro world America is now inhabiting were it not for Twitter, which immediately adopted the hashtag #lastnightinSweden. The tweets there will warm your heart (especially if you like Ikea and the Swedish Chef). Also, I’m moving to Sweden. What Have We Learned From This Binge Watch 2: What Makes a Good Story Team Leader?